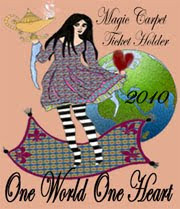 Grab your ticket and Climb on board the magic carpet to share the journey with bloggers all over the world. The One World One Heart Giveaway was started by Lisa from A Whimsical bohemian three years ago as a way for bloggers to connect. I just started my blog this year and thought it would be fun to join in. Anyone can join in my giveaway. You don't need to have a blog, just make sure you leave a way for me to reach you. (Leave a contact e-mail or some way I can reach you). The giveaway ends on Feb. 15Th at 5:00PM and will close at that time. I will have three prizes, and my husband will pick the names out of a hat (really a bowl), just make sure you only enter one comment! Others will be disqualified. First name drawn gets first pick, second name drawn gets second pick, etc. 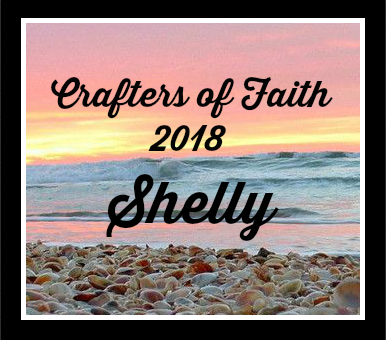 This blog tour includes artisans of all areas not just paper crafting, so I wanted to include some of my other projects from other areas of interest. 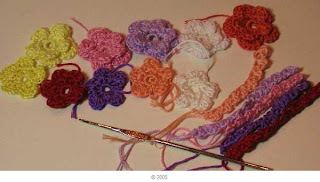 Next, I learned to crochet flowers- these are made with DMC 6 stranded cotton threads. I also made 5 pieces of edging that is 3-4 inches long for you to use like you would German scrap on your project. These Artist Trading Cards (2 1/2 x 3 1/2) all use Technique Junkies techniques in one way or another. They are all signed on the back and the Technique is mentioned. If you would like to join in on this International Blog Hop, go to Lisa S's blog and read the info- then contact her directly. Entries will be accepted until Feb. 8th. 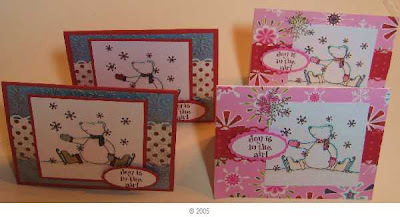 If you like Digital Stamps, there is a fun digi store and blog to follow called Designed2Delight. The first week of the month there is a FREE digital image- that will be this coming week. If you make a card and upload it with a link (to Mr Linky) on her blog before the week is up, you will get the next week's digital image free. 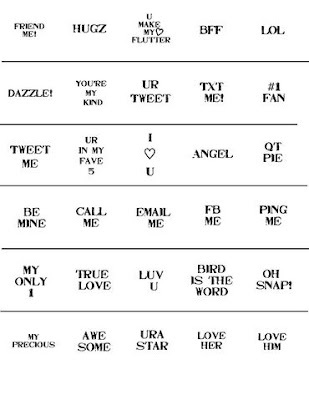 Refer a friend that mentions your name when uploading on Mr Blinkie, and you will get an additional freebie. Can you see the hearts at the tips of the snowflakes??? Such a sweet image that could be used for Christmas or Holiday season as Thank You notes, or for winter "Love" or for Valentines....... can you tell I really like this cute image??? It is colored with SU markers and a touch of Copic markers added for the highlights (B000, W1, W5). The Bordering Blue CS background has a technique called Metallic Pop that does not show up too well in the photo..... I added another touch of glitz with the Sakura gel pen to the gloves and the centers of the snowflakes. 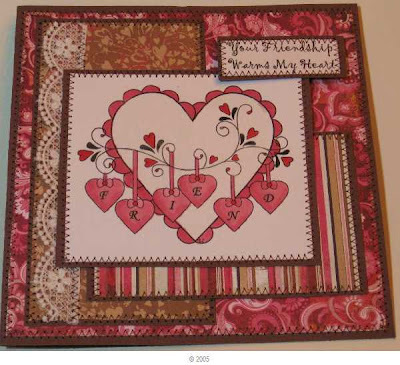 The red DSP is punched with the SU SAB scalloped edge punch, and the sentiment punched with the oval and scalloped oval punches by SU. Here is my pink version- colored with Copic markers E0000, E000, C2, C3, W1, W3, W5, B000, R81, R85 and Sakura Gel pen for a touch of glitz. I added the rhinestone snowflake for a little more glitz. I challenged myself to keep up with a challenge called Christmas Cards all Year long- I need to make 5 cards a month- I have made 2 this month previously, here are the remainder of the cards. (Last minute, but I know I will be happy in November and Dec. to have these!). 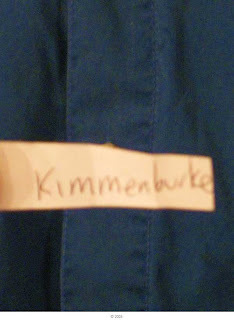 I put my husband to work tonight again- here is the name of the winner: Kimmenburke Congrats- I have no contact information to reach you, so we'll give you a week to contact me to pick your set and send me your mailing address. 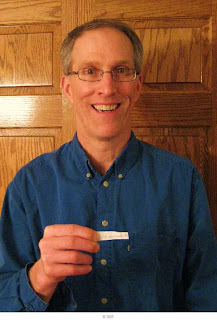 Thanks to all who played along in my Blog Candy Give-away! 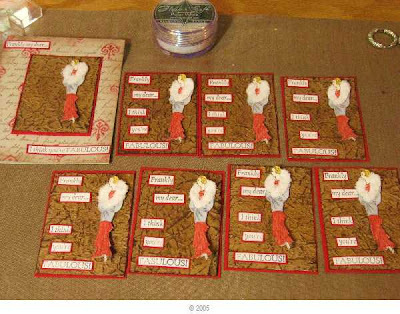 I will also cut and mount them in a CD case and apply Tack it over and over again if you so desire. Just leave a comment her on this post for a chance to win! I am late this week for my Bloggers Challenge Post- Sorry- I have been having bad, very bad headaches, and just could not stamp yesterday or this AM. I am so glad I feel good enough to stamp tonight, I had a blast with my card making! I used a new set from Firecracker Designs by Pamela called Got Chocolate. 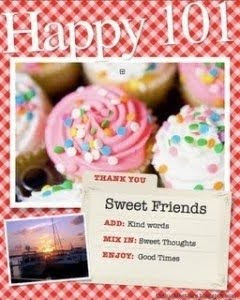 This is a fun set and I can see using it all year long for Birthdays or a 'sweet note' to a friend! 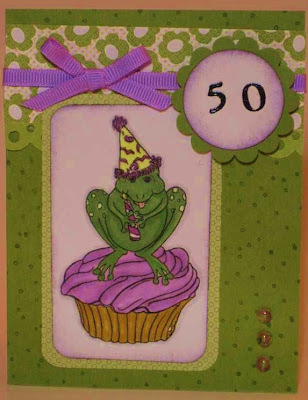 The A-4 card is my Bloggers Challenge card-made for a Birthday. 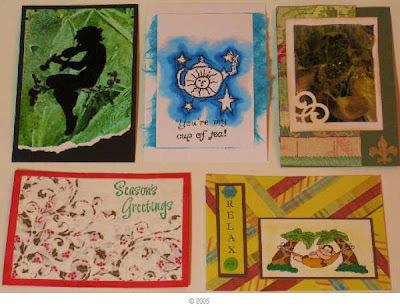 All Stampe FCD except for the Sentiment- it is SU SAB (Happy Moments). The DSP is from the SU Occasions Mini-Oh La La this paper is so much better IRL than it is in the catalog!!! I almost hate to use it........ The dounle sided satin ribbon is also new from SU- Love it! I colored the image and all of the truffles in Copic markers. The sentiment tag is from the Heritage Cricut cartridge and I used DTP (direct to paper) to color it with Choc Chip SU ink. I had one more image and decided to make a card using the sketch challenge from Papertake (Tuesday challenge). I used the SU scallop oval punch for the bite out of the sentiment. BG is SU Choc Chip and the DSP is again from the SU Occasions mini. The stamps are the same Got Chocolate set from FCD. I could send this card to any member of my immediate family and it would be most appropriate. My Dad is quite the cake baker- so I think I will send it to him (and my Mom)! My favorite Chocolate is Milk Chocolate and Fannie May- or Dove Chocolates. What is your favorite Chocolate or candy??? While you are there, check out the two NEW Heart Digi's available today- Conversation Heart and Give My Heart Wings. I am off to an appointment, but will be home to papercraft later this afternoon! Firecracker Designs by Pamela has introduced a new Digital Image Designer today! And, the artist is Cat Gondak who is also a Technique Junkie- so I have had the pleasure of seeing her creative artwork AND have a few pieces she made for the Technique Junkies ATC swap. Welcome Cat!!! You can check out her blog- the link is on my sidebar with the other FCD team members. Well, I also had this great AI Foil background (a Technique Junkies technique) on my desk- I made it months ago as well...... I thought it would make a darling card for the Greeting Farm Challenge that I saw on their blog tonight......While they are at CHA, each day they will post a digital image, and if you make a card with it and post it to the blog, you will get the next day's digi free! Oh my, I cannot resist these challenges! This little guy is called Mer Ian. I colored him with Copic Markers- E000, E00, C2, Y13, Y15, BG05, BG09, BG10. I added a tree stamped in a Kaleidoscope color pad with a retired SU stamp. I like the effect and the touch of color on the top. Next, I stamped the Happy Birthday-another retired SU stamp in Tempting Turquoise, backed it with Gable Green and that with Temp. Turquoise and put that up on dimensionals. This digi challenge closes at 6PM tomorrow (Monday 1/25). Thanks so much for stopping by and I hope you will go check out Cat's new Digi Images at FCD. 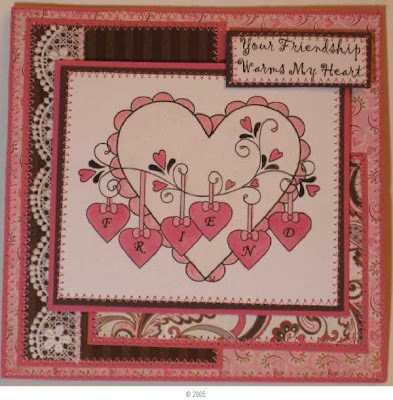 Pamela, the owner of FCD is also adding new images Monday 1/25, and look for some FREE sentiment images to be released Tuesday 1/26-along with a tutorial on how to cut them out. I recently joined a wonderful Blogging group called Sisterhood of the Blogging Stampers- aka SBS29. I recieved this award today from Kim- how sweet of you-Thank You! 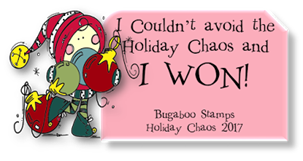 I am to choose 10 things that make e happy, then 5 other Bloggers to share this award with- and that is going to be a really hard choice- so I will randomly pick a stamper from each of my blogging groups and one from my FCD DT crew. 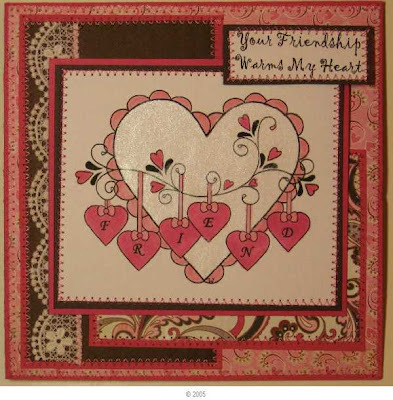 6)All of my friends, and especially my stamping friends! 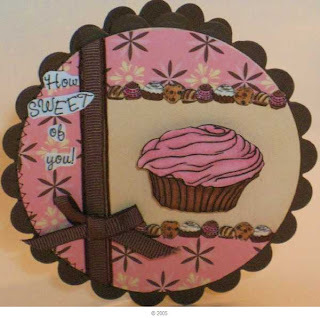 10)Being a member of Paper crafting networks- SBS29 and my blogging groups, Firecracker Designs by Pamela DT, Technique Junkies and Splitcoaststampers. Not easy, but these are the ladies I choose to share this sweet award! Vicki-Sweet Dreamers-sends me lots of Blessings! Lynn- Stamps R Us-very inspiring to me! Mary G-Glitterbees founder-Bless her heart-very warm hearted! OK- I am off to send this award to the above ladies! There will be a winner from posts made to the Design Team blogs, and the winner will be chosen from a mystery blog hostess that we don’t even know who it will be until the hop is over…so that’s why you’ll want to leave a comment on EVERY blog, so you don’t miss out! "0", C2, C3, B21, B24, E33, E35, E37, E47, E57, R24, R27, G20, G85, G99 Plus, Su Markers Old Olive and Close to Cocoa. 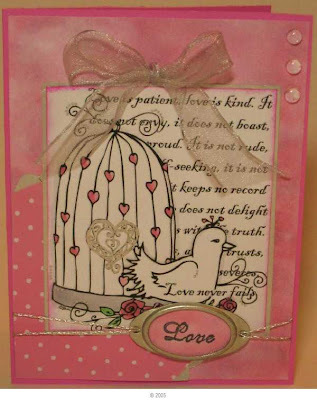 I used the haystack in the stamp set for the foilage on the bottom below the fence. 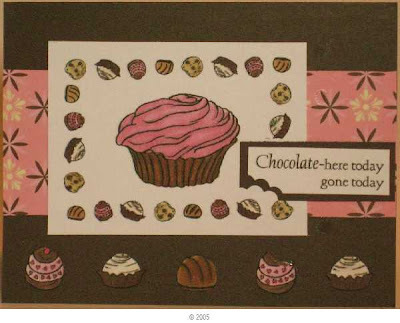 I colored 1/2 the stamp with Old Olive and stamped it repeatedly, then went over it lightly with Close to Cocoa. I added flowers with Flower Soft in the Floral Bouquet collection from FCD. I dotted the white above the ground with Old Olive marker. The background of the card is called Spritzed Stone and is a Technique Junkies technique using Copic markers. It is soft and pretty IRL. The card stock is SU Ballet Blue and Real Red. The white is Georgia Pacific. Here is my winter scene. This tree is cut out with the Cricut. I painted the Bg over the Spritzed Stone with Ranger Rock Candy Distress Crackle paint in a thin layer- that gives the bacground a shimmery look. Then I added stickles for a wintery look. Here are the ATC's I made- if you are a Technique Junkie that does the TJ ATC swaps- the ones on the right are on their way to Juliet's house via USPS now. and keep going until you’ve come back to where you’ve started! Thanks so much for playing along with us and we hope you have a great time! 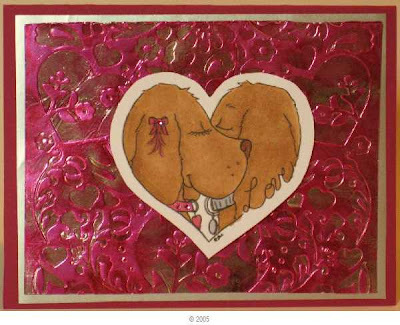 Today I made a card with the Designed 2 Delight digital image for this week. Faith offers a free digital image the first week of each month, and if you play along and post a card, you get the next digi image free. If you want to jump in at any time, you can purchase the next image. If you play along, you are considered to be a member of her Artistic team. I colored the image with Copics R85, C2, C3, E33, E35, E37. I used a new Valentine Cuttlebug folder that my Blogging sister Karli 'enabled' me to get.....she twisted my arm- from the Home Shopping network.....I used a technique from the Technique Junkies called AI Foil and Red Stazon Ink. 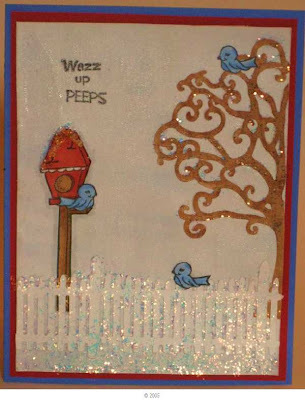 I layered on Metallic Silver paper and SU Purely Pomegrante card stock. I added some bling on the bow and the collar-rhinestones in Valentine colors from Archivers. Yummy- I love PINK (and Blue), so I have to say I am really loving this time of year and crafting! Next- this was a gift from a friend Diane. She is multi-talented and can do anything! 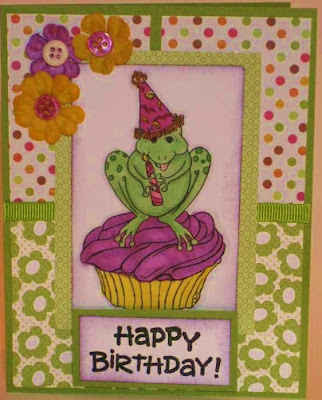 We did a little stamping Years ago, and she has a newfound interest in stamping- Stamp TV is teaching her ALOT! I challenged her to a swap (which I have not made yet by the way......) to make ATC sized shutter cards- Diane has mine finished- isn't it awesome??? I LOVE this- the silver is recycled and is Wrapping paper. 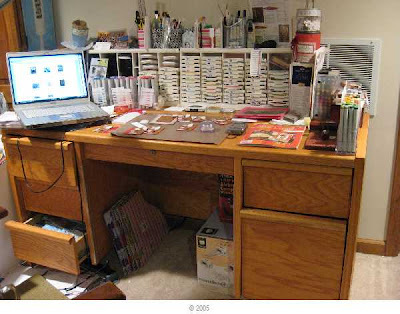 Finally, this is what I did last Sunday and Monday...organized a corner of my paper crafting room. I took all of my mounted stamps and put them in Portfolio cases or the Stampendous " storage containers my friend Nancy found. I took all of my stamps out of clam shell cases- such a great space savings. I still have a ton of re-organizing to do, but what a huge job to have behind me! I am also going to index these stamps- eventually. 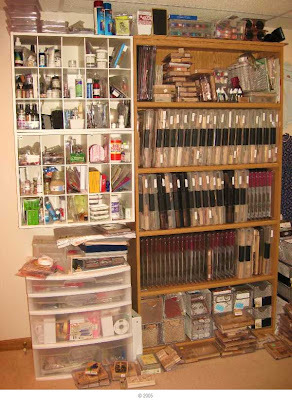 The wire baskets at the bottom are my background stamps and my unmounted rubber stamps- I have more on the other side of the room......... (I went into Office Depot and found this bookcase on sale for $15.00!!!). I also spent yesterday and today getting ready for the Firecracker Designs by Pamela Blog Hop this weekend- Please join us for a fun Reuse, Reduce, Recycle and I combined my post with my Friday Bloggers Challenge. Here is the Direct Link to my Blog Candy-running through Jan 30th-please stop by and leave a comment if you have not already done so. I decided to make my Glitterbee's Challenge card tonight as well, so needed to incorporate a color challenge- Positively Pink, Bashful Blue and Certainly Celery. I added in a Sketch Challenge from Crazy 4 Challenges as well...... I colored the Digi Image from D2D in with Copic markers RV23, RV25, W1, C2, C3, B21, B23, E31, E33. I used a Glue Pen and added SU Dazzling Diamonds to the whipped Cream. The DSP is from SU, and the ribbon is from Target $1.00 Spot from last year. 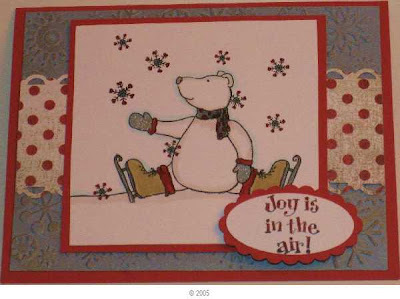 I used the SU oval and scallop oval punch for the sentiment plus dimensionals. For a final touch, I pierced the top edges. 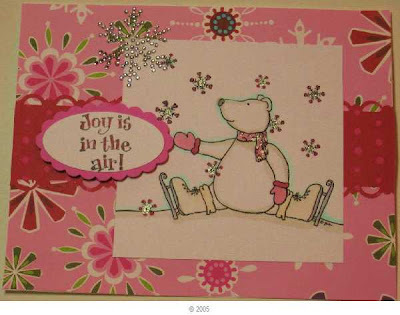 For my next card, I used the same digital image a touch smaller and this time, I used SU markers Certainly Celery, Positively Pink and Blue Bliss, plus Creamy Carmel to color the image. I sponged Pos Pink around the image and pierced the one corner for balance. 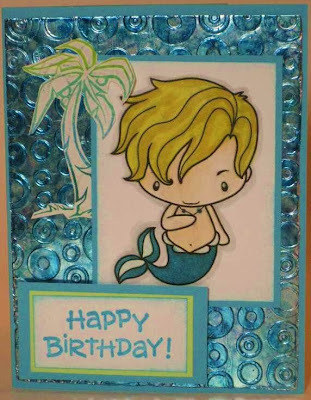 The BG is White cardstock run through the Cuttlebug and highlighted with Blue Bliss ink direct from the ink pad. Using the Sketch Challenge from Aly's Sunday Sketch, I added some ribbon on the Lt side of the image, and added the sentiment and then more ribbon to complete the sketch. I added 2 colors of Green ribbon in addition to the Pink ribbon with hearts to qualify for one more Challenge....Pile it on! 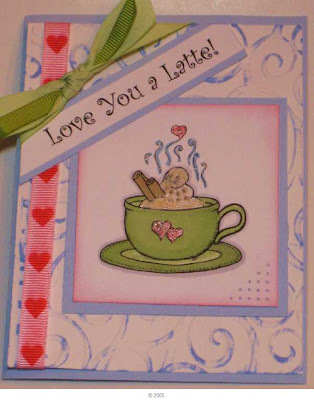 For the whipped cream on this card- I tried something brand new to me- Liquid Applique in a Vanilla color to add texture. 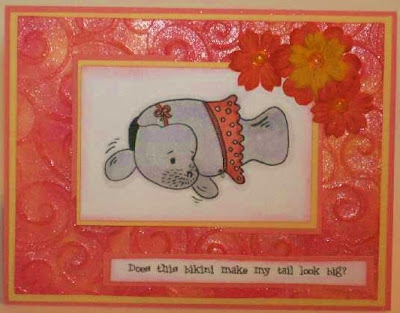 For three textures of Cuttlebug Highlights, the piercing and the Liquid Applique, that also qualifies the card for another challenge- Crafty Creations. I added Glitter via the Sakura Gelly Roll Pen- the touch of Gold makes the hearts on the cup and the one in the steam really sparkle. Finally, I wanted to share a picture of my Copic color card I keep in the rack with my Copic markers by color family. 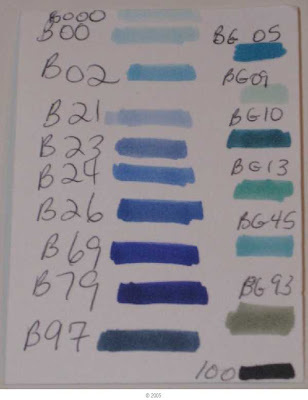 Mary Ann, who is the authority on Copics- her blog- I Like Markers- suggests making a color chart for your Copics on the paper you use when coloring images with Copics. I have a full sized color chart, and additionally, I take these ATC sized cards (2 1/2 x's 3 1/2) and make a small chart by color family. Here I have the B's and the BG's. This way, I can hold my card right up to the cardstock I am using to find the closest match I have to the cardstock I am using without the visual distractions of the 'other' colors on the color chart. I make these for my Bic and Sharpie markers as well. Thanks for stopping by today- I hope you have a wonderful Martin Luther King Day- hopefully off work- and better yet- I hope doing whatever it is you enjoy most. We have a new Digi designer at Firecracker Designs by Pamela, and I just fell in love with this image immediately. I used the image from Cherish You and the Sentiment from Warm my Heart-both just released today. I am getting together with my 'Sewing friends' next weekend, and have 6 cards to make- well here are two I will not be doing at the last minute! So, the image was printed from the computer, colored with Copic Markers -for the lighter card RV32 and RV34, and for the darker card, R46, R83 and R85. I painted Shimmerz on last-after coloring with the Copic markers- and for future reference- you cannot color with Copics on an image once it is painted with Shimmerz........so make sure you do all of your touch-ups first. I added some lace to the side panel and zig-zagged around all of the layers. I used the Sketch from Mercy's Tuesday Sketch challenge to get my MoJo started- it is wonderful! 2 Red Banana's-Think Round- my 3rd card to meet this challenge this week! 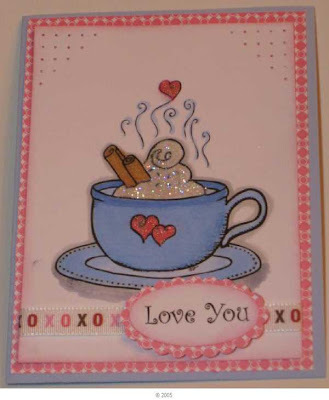 I am thinking I will put up a few tips about sewing on cards- is anyone interested in that?? I put my husband up to picking a winner again- he was self conscious about how he looked, because last time I put him up to this he got a comment that he was hot- should I go change my shirt??? First- Thanks to all who posted a comment for a chance to win and for those that added the candy on their side bar and joined as a Follower. I truly do love stamping and sharing with you and seeing what everyone else is creating! I also appreciate all of the soldiers and their families. Awesome candy that I would love to use in my cards for Operation Write Home! 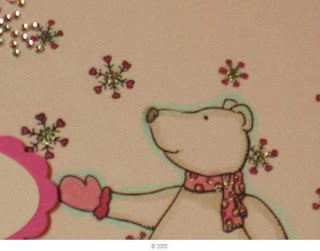 We just finished up on our Valentine's cards, but I always also send in Love, Thinking of You, Birthday, Anniversary & other non-seasonal cards with every batch. My daughter served in Iraq & her unit received cards from Operation Write Home as well as mine, so I've continued my support. 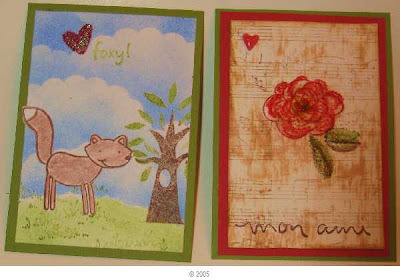 I also make Valentines for the veteran's in local nursing homes. I have the JROTC kids deliver them for a special touch. Keep up your good work, as I know the soldiers do for us! I'm following you now too! Way to go Ray- looks like the stamps will be put to very good use!!! That is wonderful! And, would you like for me to trim it and put Tack it over and over again on the back to make it sticky??? I am happy to do that if you would like. I have hit that half century mark, and so have my friends. I need two more Birthday cards in the next two weeks- one for a woman and one for a gentleman friend. As you know, I am on a mission to use the Copic markers and improve my shading....I need lots of practice too- so I used another digital image in my 'to do' pile. For the first card, I used the sketch from the MOJO Monday site. It worked beautifully with the image and the '50'....... I really enjoy the challenges, as it really stretches me- and I try things I may not have thought of before....the card also meets a couple of other challenges as well. Ink:Versamark, Black EP, SU scallop Punch, Nestability circle. Believe it or not, I try to use Copics close in color to SU colors-since that is the paper I use- and I consulted the SU color chart to see what coordinated with Old Olive........ (More Mustard and Eggplant Envy). I colored white Prima's and buttons with Copics to coordinate- my first time trying this........ I sponged on a touch of the eggplant on the edges of the white and that softened the look a bit. 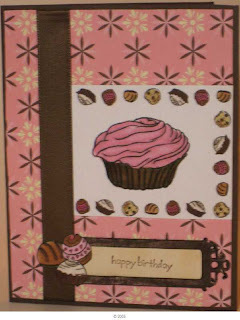 Birthday sentiment is embossed and is up on dimensionals. Again, I participated in a number of challenges- and I have to say I am glad I did, because I really like the sketch and it was fun to color the flowers and buttons- another first for me. 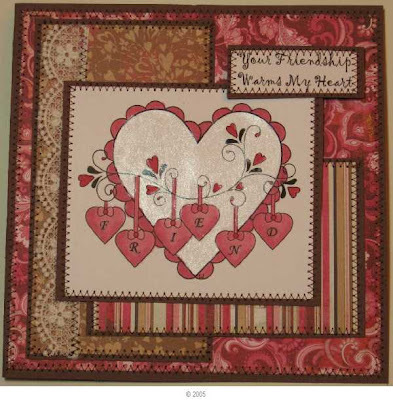 Whew- oh- I also wanted to share a gorgeous 1-4-1 Technique Junkies swap card from Vaudene- a very talented stamper. She used the Burnished Background Technique- it is just gorgeous!!! 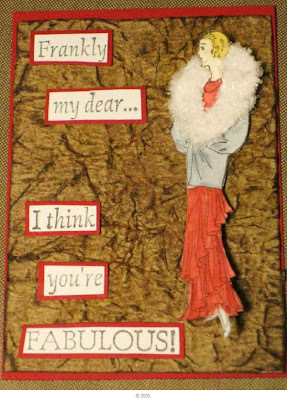 My next day off, I am going to work to attempt to make her a card worthy of mailing to her......!!! 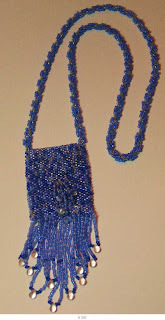 If you did not comment on my previous post for BLOG CANDY- well, you have until Friday to win!!! I have been keeping my eyes open for free digital images to practice on my Copic and Prismacolor pencil skills, when I happened along the Delightful Inspiration blog with a Free Digi challenge. If you play with the first image of the month, you get the following weeks digi image free.....so I started playing along, and I am having a blast! This week the image is free- and isn't this gorgeous??? If you miss out- you can go to the digi store and purchase an image to get started, then the next image is free......if you refer a friend-and they mention your name- you get an additional free image. (Please mention my name in your link if you would- I will recieve an additional image!). OK, my card this week was made using Copic Markers. I colored with R81, R83, R85, G21, C1, C2, and C5. I colored over the middle heart with the Signo Silver Metallic Pen. I outlined the image and bird with C1. The CS is Pixie Pink by SU, Silver metallic and G.P. White. The BG paper is made with a Technique Junkies Technique called Spritzed Stone- using Copic Markers. If you know me.....you know that I LOVE trying new Techniques and I will be making more of these pretty backgrounds for sure-it is so much prettier IRL! I stamped the sentiment from Firecracker Designs by Pamela Flourishes 6 and placed it in a metal frame, and attached this to the card using Silver Metallic cording. The bow on top is a wired metallic Silver ribbon-and is attached with a glue dot. I added clear Dew Drops so the BG color would show through. Cooking it up with Katie-color challenge, an unusual Valentine and a new technique! Now, on for the good stuff!!! BLOG CANDY!!! At work, I share a desk with a nurse Mini. Mini's son is going to be heading to Afghanistan next month. So, I want to offer this set from Firecracker Designs by Pamela as blog candy and ask for you all to say a prayer to ask God to comfort him and keep him safe so far away from home and on such a dangerous mission. +If you post my blog candy to a blog, leave me a note and I will enter you twice. +If you become a follower of my blog, leave me a note and I will add you for another chance to win! +Send a friend who becomes a follower and I will add you for another chance to win! I will announce the winner FRIDAY, JAN 15th!!! Today our Bloggers Challenge is a Sketch challenge. I made a card that is totally different than my usual-the bold monochromatic colors of the DP attracted me for a Thank You card I need. I just purchased the DP from Joann's (on sale...) because I thought it coordinates really well with the Elephants on Parade set from Firecracker Designs by Pamela. I inked the Elephant with Chocolate Chip ink then Versamark on Confetti CS by SU, and then I clear embossed it. I also stamped the sentiment the same way. 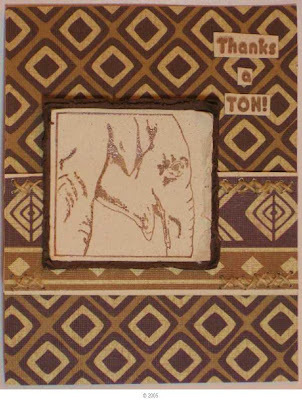 I backed the elephant image with Chocolate Chip CS from SU using the torn frames technique from the Technique Junkies. I punched the edges of the middle panel with a 1/16" punch and used a #18 Tapestry needle and wove in my recent purchase that coordinates nicely-jute- to give it a touch of embellishment. 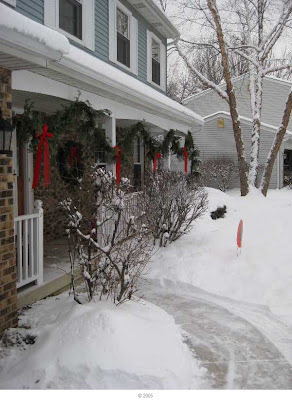 Here is a peak of the pretty snow here- my husband snapped this today- the snow is so pretty! Thanks for stopping by my blog today- please check the Bloggers Challenge icon on my sidebar to see other Sketch Challenge creations! I am thrilled to have finished the ATC's I made for the Technique Junkies perpetual swap today. My personal goal is to make a set a month, and I usually cannot seem to achieve this....... It has been a few months. The swap is on-going, so when ever I have time, I make a set of 5 to 10 ATC's and mail them in to our Swap Coordinator Juliet- in return, I get as many ATC's as I send in- all use some sort of Technique Junkies Technique on them. For these ATC's, my technique is called Antique Paper. The stamps are Firecracker Designs by Pamela. I colored them with Copics and used Polar White Flowersoft (FCD) on the fur collar. The Copic colors I used are in this Blog post from 1/1. 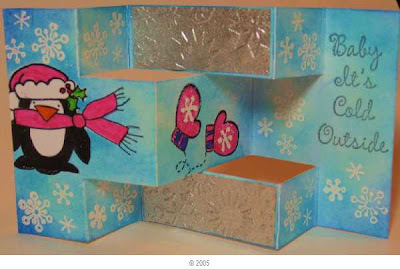 This is the post where I have the full sized card. 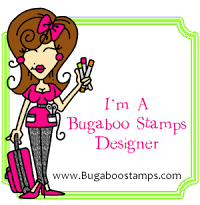 I joined a new Blogging Group-Sisterhood of the Blogging Stampers. Before I introduce myself, I want to show you what I am up to lately. 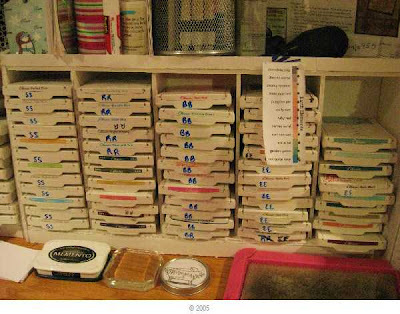 Slowly as I have been accumulating stamps and supplies over the years...my 'stuff'' has almost completely filled up my kitchen pantry- which is not small...... And, because I stamp in the kitchen, sometimes my stamping supplies are out on the table for a few days....... I decided that my task was going to be to reorganize my sewing supplies- get rid of alot of unused fabrics and patterns and make room for my stamping supplies in 1/2 of my sewing room..
Two things you should know about me- I am a little Obsessive/Compulsive -as in I buy alot of 'stuff'-cause I stamp (or sew) late at night when the stores are closed..... that is the obsessive part. The Compulsive part of me is a sorter- so I have lots of stuff packed into the space it is in very efficiently. Next- where to put all of my stamp pads....... I found a tutorial for these stamp pad holders last year- Here is the link to a blog where Stacey King introduced this core board stamp pad holder-holds 60 ink pads- that you can make for $6.00. The receipt for my core board is dated 1/29/09......... OK, well I saved it for a freezing cold day in 2010! I made 2 of these holders and still have Chalk inks that I will have to store somewhere else- I am really liking how this is working- I have the pads at my fingertips and my markers as well. Ok- you have probably noticed I am a little chatty- yep! I come by it honestly- it has been passed on from my Father- there is a 100% proof silly gene that I also inherited that I am also quite proud of-also from Dad. I am from an Irish Catholic family with 7 kids. I grew up in Kankakee,Illinois (right on the river-south of the damn.....). I left home to go to college at Northern Illinois-where I studied Nursing. I lived for one year in Cincinnati, Ohio, and my husband came and got me and once we were married, live in Wheaton, Illinois. I have always been involved in some type of creativity- in my younger years I learned to sew, knit, crochet, Macrame, etc.....I smocked beautiful garments for my kids when they were younger. I started Stamping once the kids hit school age and the teachers gave me stamped cards as a Thank You gift. 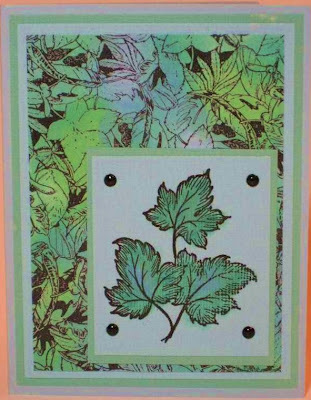 I found Stampin Up- but needed more than workshops- once I got home I had no clue what to do with the stamps....... I found Splitcoaststampers in 2004 AND Technique Junkies in 6/04. I was hooked! I have learned alot and my stamping has come a long way since that time. My joy comes from trying new techniques. 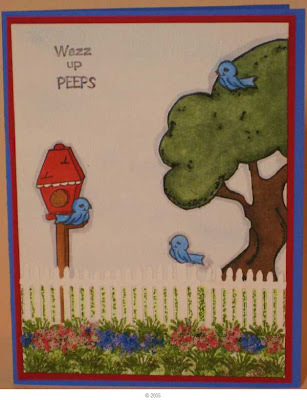 The cards where I stamp, color and add DSP are not my favorite- I enjoy the challenge of learning something new. If you look back at my cards, I truly am inspired by the Techniques I learn from the technique Junkies. Color and shading are my 2 biggest challenges, and I am currently working on Copic marker and Prismacolor coloring of images. I look forward to getting to know you all better and to have fun trying some new challenges. Oh- I cannot always do all of them, as I forgot to mention- I mentioned my husband Ray, but not the kids- I have 3 children-2 are in college, so I work......... I enjoy my work, but do not have as much free time to stamp as I once did. (I work one week on, one week off as a nurse in a Pre-Procedure Dept). My twins are Juniors in College-Chris at University of Illinois (Champaign) and Katie at Ohio State University. My youngest daughter Stephanie is a Junior in High School. She likes to study and is very bright. She keeps herself busy with sports- Cross Country, Basketball and Track, so we spend a bit of our time watching the school sports- we will miss it when she graduates. 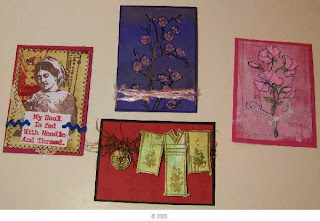 I started my blog just recently when I saw a Design team call for Firecracker Designs by Pamela- so I am new to this- there is still alot I have not figured out about it. I love networking with others to learn and grow as a stamper, plus to meet some friends along the way. I believe I have gone on long enough. Happy New Year to all and I look forward to getting to know you all better. Thanks Kim for the call out to join in a blogging group!